As Volkswagen plots a course toward its goal of becoming the world's biggest automaker by 2018, it's increasingly clear that the path to global dominance runs through places such as Western China's Lanzhou. The capital of the landlocked Gansu province, which borders the Gobi Desert, is home to 11 dealerships for VW and its sibling brands, Audi and Skoda. With a population of 3.6 million and gross domestic product per capita of $4,100, Lanzhou is the type of smaller city away from China's prosperous east coast that VW is targeting in its next phase of expansion. "Volkswagen's early entry into China meant that our outlets focused on bigger, developed cities," said Soh Weiming, the carmaker's exec VP in China. "Now, we have to expand beyond them." Less-developed Chinese cities are VW's "bread and butter," Mr. Soh said last week in an interview at the Guangzhou auto show. Increasing sales in such far-flung places is the primary challenge facing Jochem Heizmann, who took over as VW's China country head on Sept. 1. The appointment of Mr. Heizmann, a former trucks chief and head of production planning at the company, underlines the importance of China in VW's plans to overtake General Motors and Toyota Motor Corp. It is also the first time that VW's executive overseeing China has been on the company's group management board, a move that VW says streamlines its daily business there. At stake is a market that IHS Automotive and Macquarie Securities project will eclipse the combined sales of the United States, Germany and Japan in three years. VW Group's Volkswagen, Audi and Skoda brands account for a fifth of China's passenger vehicle deliveries, well ahead of General Motors, at 9.9% with its Buick and Chevrolet brands, according to researcher LMC Automotive. VW intends to consolidate its lead with aggressive investment that outpaces the expansion plans of its rivals. The German company expects that to help it win over the next wave of Chinese car buyers, made up of mostly first-timers who have little brand allegiance. "Chinese consumers are notoriously disloyal," said Bill Russo, president of Synergistics Ltd., a market researcher in Beijing. "Volkswagen's challenge is continuing to build customer relationship management, and be geographically in the high-growth regions." China's smaller cities will account for 60% of new car deliveries by the end of the decade, up from 40% in the past 10 years, McKinsey & Co. predicts. Car sales in so-called third- and fourth-tier cities will grow 10% annually until 2020, vs. 4% in Shanghai and Beijing, McKinsey said. The country, already the world's largest auto market, will grow in importance as a debt crisis dampens vehicle sales in Europe. "Globally, growth will be a bit slow," Mr. Heizmann told reporters on Nov. 21. "China is different," he said. "In China, every business, every brand is selling especially well." VW's joint ventures with SAIC Motor Corp. and China FAW Group Corp. operate or have announced plans for 11 factories in China, with a targeted capacity of 4 million vehicles a year by 2018. The automaker, which also owns Seat, Bentley and Lamborghini, will have to persuade consumers such as 23-year-old flight attendant Shiny Yao to buy from and stay with the group. "There are so many choices," said Yao, a Shanghai resident who bought a Honda Civic last month. "If I switch cars, I know I'll not buy another Honda. I'll definitely try something new." VW plans to recruit more dealers, increase the number of locally made models for its Skoda brand and introduce plug-in hybrid vehicles for sale in the "near future," according to a company statement. Sales for Skoda, the Czech carmaker that VW took over after the collapse of communism, rose 7% to 181,900 units in China in the first nine months of this year. The country became Skoda's biggest market in 2010, three years after it started local production. Volkswagen's China sales will reach almost 2.7 million vehicles this year, or 30% of its global total, Norddeutsche Landesbank predicts. The automaker sold 2.3 million vehicles in China in 2011. "For 60 years, the most important market for VW was Germany; they sold around 1 million cars there," said Norddeutsche Landesbank analyst Frank Schwope. "Four or five years back, China overtook the German market. Now VW is still going to sell 1 million cars in Germany, but 2.7 million cars in China." UK luxury carmaker Jaguar Land Rover, or JLR, has received approval from the Chinese government to develop a joint venture with Chinese automaker Chery Automobile. The one point six billion US dollar joint venture will be Jaguar Land Rover's first attempt at making vehicles in China. The approval comes as results show JLR sales in China have increased by 80% this year. To learn more about the joint venture, Brandon Blackburn-Dwyer is speaking with Yale Zhang, Managing Director of the Shanghai-based Auto Foresight Co. Ltd and Bill Russo, President and founder of Synergistics Ltd and Senior Advisor with Booz & Company. The interview begins 14:37 minutes into the broadcast. 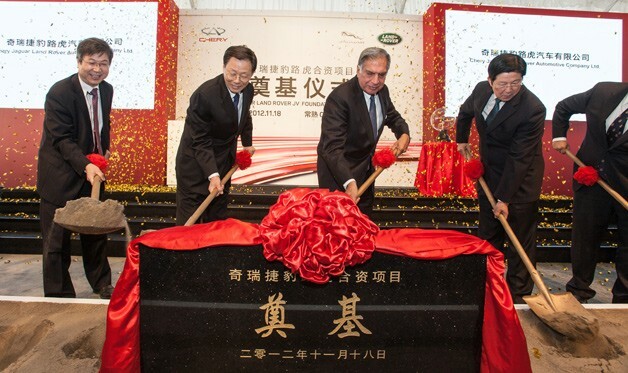 1 )Do you support the Joint venture between Chery and JLR? Who is the bigger winner here? 2) What is Chery looking for from the partnership? What benefits does the JV bring to Chery? 3) Chery is very much established as a mid-range car brand while JLR is more at the high-end/luxury end. Does this create problems with strategic fit or does it ensure there is no competition between the two parent companies of the JV? Can JLR avoid being tagged with Cherry's reputation? 4) Research by the state-owned China Lianhe Credit Rating Co. shows Chery would have lost money every year for the past three years were it not for government subsidies. If that's the case, will the JV help Chery and how? 5) JLR's sales are rapidly expanding in China, why are they looking to form a JV if they are already doing so well as an import brand? 6) JLR combines high end passenger vehicles in the Jaguar brand and large scale jeeps in the land rover brand, which is more popular? Can JLR really push its large SUVs into the Asian and particularly Chinese Market? 7) Overall is Chery the right on the ground partner for JLR? What benefits does it bring to JLR over other possible partners? 8) Does this JV tell us anything about the wider car market in China? 9) Are JVs the best strategy for local Chinese brand auto makers like Chery? Are JVs a good strategy for foreign brands entering the Chinese auto market? Or is it part of the regulation they ask required to follow? 10) What advice would you give to Chery and JLR moving forward? 11) What can others learn from this partnership? BACK ANCHOR: That was Brandon Blackburn-Dwyer speaking with Yale Zhang, Managing Director of the Shanghai-based Auto Foresight Co. Ltd and Bill Russo, President and founder of Synergistics Ltd and Senior Advisor with Booz & Company. As Volkswagen AG (VOW) plots a course toward its goal of becoming the world’s biggest automaker by 2018, it’s increasingly clear that the path to global dominance runs through places like Lanzhou, in western China. The capital of landlocked Gansu province, which borders the Gobi Desert, is home to a total of 11 dealerships for VW and its sister brands, Audi and Skoda. With a population of 3.6 million, and GDP per capita of about $4,100, Lanzhou is the type of smaller city away from China’s prosperous east coast that VW is targeting in its next phase of expansion. Less-developed Chinese cities are VW’s “bread and butter,” Soh said in an interview at the Guangzhou Autoshow on Nov. 21. Increasing sales in such far-flung places is the primary challenge facing Jochem Heizmann, who took over as VW’s China country head on Sept. 1. The appointment of Heizmann, a former trucks chief and head of production planning at the company, underlines the importance of China in VW’s plans to overtake General Motors Co. and Toyota Motor Corp. (7203) It is also the first time that VW’s executive overseeing China has been on the company’s group management board, a move VW says increases flexibility and streamlines its daily business there. At stake is a market that IHS Automotive and Macquarie Securities project will eclipse the combined sales of the U.S., Germany and Japan in three years. VW’s Volkswagen, Audi and Skoda brands account for a fifth of China’s passenger vehicle deliveries, well ahead of General Motors Co. (GM), at 9.9 percent with its Buick and Chevrolet nameplates, according to researcher LMC Automotive. Hyundai Motor Co. stands at No. 3 with 9.7 percent, LMC said. VW intends to consolidate its lead with aggressive investment that outpaces that planned by rivals. VW’s China ventures have pledged to spend 9.8 billion euros ($12.6 billion) in China through 2015, while GM says it will invest as much as $7 billion in the five years to 2015. The German company expects that spending differential to help it win over the next wave of Chinese car buyers, made up of mostly first-timers who have little brand allegiance. China’s smaller cities will account for 60 percent of new car deliveries by the end of the decade, up from 40 percent in the past 10 years, McKinsey & Co. predicts. Car sales in so- called third- and fourth-tier cities will grow about 10 percent annually until 2020, versus 4 percent a year in Shanghai and Beijing, McKinsey said. The country, already the world’s largest auto market, is set to grow in importance, as a drawn out debt crisis weighs on vehicle sales in Europe. Trained as an engineer with a doctorate from Karlsruhe University in Germany, Heizmann is no stranger to the country. The 60-year-old oversaw factory expansion in China almost two decades ago when he was in charge of planning and commissioning new passenger-car plants at VW. From 2001 to 2007, Heizmann oversaw global production for Audi (NSU), which now counts China as its biggest market. In 2004, he was made a guest professor at Shanghai’s Tongji University, which has a research partnership with Audi. VW’s joint ventures with SAIC Motor Corp. (600104) and China FAW Group Corp. operate or have announced plans for 11 factories in China, with a targeted capacity of 4 million vehicles a year by 2018. The carmaker is also considering a new 300,000-unit plant in Changsha in southern Hunan province, a person familiar with company’s plans said this month. VW, based in Wolfsburg, Germany, is currently negotiating an extension to its tie-up with FAW, with which it runs a joint venture making the Jetta sedan and the Audi A6L, a luxury model that was stretched to boost its appeal to Chinese buyers. The automaker, which also owns Seat, Bentley and Lamborghini, will have to persuade consumers like 23-year-old flight attendant Shiny Yao to buy from and stay with the group. VW plans to recruit more dealers, increase the number of locally made models for its Skoda brand, and introduce plug-in hybrid vehicles for sale in the “near future,” according to a company statement. Sales for Skoda, the Czech carmaker that VW took over after the collapse of communism, rose 6.8 percent to 181,900 units China in the first nine months of this year, company data show. The country became Skoda’s biggest market in 2010, three years after it started local production. Heizmann will also have to work to hold on to existing customers unhappy over faults this year with a direct-shift gearbox system that affected some cars, said Jochen Siebert, Shanghai-based managing director at JSC Automotive Consulting, an industry researcher. The automaker agreed to extend the warranty for the automatic transmission technology to 10 years from the standard two years after customers complained and the quality regulator in March demanded a plan to rectify the problem. Drivers complained of noise, vibrations and, in a few cases, a failure to start in humid weather, the company said in May. Volkswagen’s China sales will reach almost 2.7 million vehicles this year, or about 30 percent of its global total, Norddeutsche Landesbank predicts. The automaker says it sold 2.26 million vehicles in China in 2011. China requires any company wanting to set up domestic production to partner with a local business. By doing so, JLR avoids a 25-percent tariff on imported cars. Chery benefits from a planned research and development center as well as a chance to "really upgrade its capabilities," according to Bill Russo of Synergistics Ltd. in Beijing.